The opening is stunning, breathtaking and spectacularly tragic: the bloodbath on Omaha Beach, June 6, 1944. 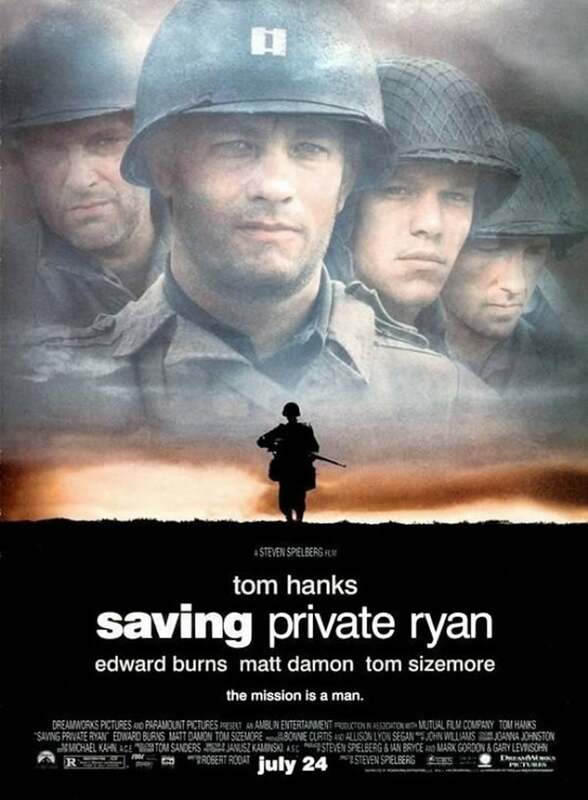 The first 28 minutes of Saving Private Ryan are something to experience and rightly considered one of the most unnerving and realistic in war movie history. Spielberg's epic drama, set during the allied invasion of Normandy and written by Robert Rodat, won the Golden Globe as Best Motion Picture – Drama. But, in a major upset and against all predictions lost the Academy Awards to Shakespeare in Love. The film received five Golden Globe nominations, winning two awards (Film and Director). The 56th Golden Globe Awards, honoring the Best in Film and Television for 1998, were held on January 24, 1999, at the Beverly Hilton Hotel. The other dramas nominated that night were Gods and Monsters, The Horse Whisperer, Elizabeth and The Truman Show. Protagonist Tom Hanks, who plays the role of the U.S. Captain tasked with saving the titular private stranded behind enemy lines (played by Matt Damon), was nominated for Best Actor – Drama, but Jim Carrey won for The Truman Show. At the Globes ceremony, Sean Connery presented the award to Saving Private Ryan. Spielberg, as the film's co-producer (for his own DreamWorks studio), accepted the award and said: “This is so completely meaningful and deeply felt.. I thank so much the HFPA”. Spielberg claimed that he considered the film a passion project and a gift to his aging father, a World War II veteran. He further claimed that he made the picture against his commercial instincts, believing there would not be a wide audience for a World War II movie with graphic violence, and was pleasantly surprised when it became a blockbuster hit. For the film, shot in France, England and Ireland, the cast endured a grueling, week-long course at boot camp instructed by technical advisor Dale Dye. Hanks, who had previously been trained by Dye for the Vietnam war scenes in Forrest Gump (1994), was the only one of them who knew it would be a hard and uncompromising experience: "The other guys, I think, were expecting something like camping in the woods and have fun around the campfire," he said.